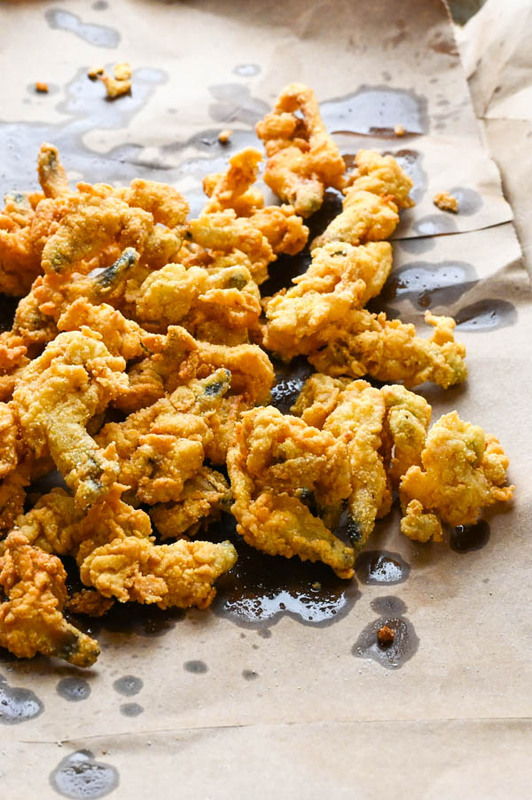 If you’re a fan of fried seafood (and who isn’t? 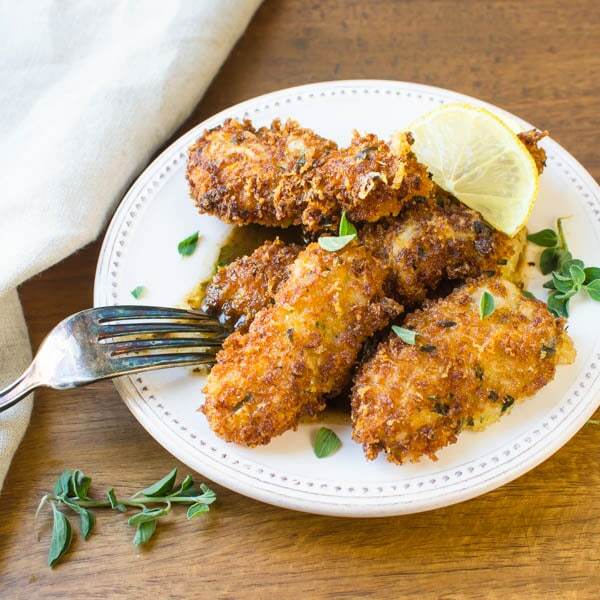 ), you’re gonna want to make a batch of these fried whole belly clams. To make them in the traditional New England style use Ipswich clams (a.k.a. Steamers or soft-shell clams) and use the whole clam bellies, strips and cleaned neck. Frying the clams is the easy part, but I’m also sharing a much easier method on how to shuck clams. Don’t forget the simple tartar sauce. Are you ready? As you may already know, our Super Bowl tradition is to serve foods that are indigenous to the regions of the country where the two competing teams are from. This makes the event more enjoyable for me (because I really don’t give two hoots about football) and the entire family gets into planning the menu. This year, it’s the LA Rams and New England (again). 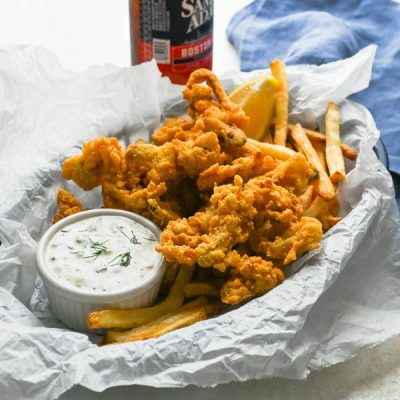 In the not so distant past we’ve celebrated New England with Authentic New England Clam Chowder, Clam Chowda Pizza, Warm Lemon Butter Lobster Rolls – and now I give you Fried Whole Belly Clams with Simple Tartar Sauce. These are a New England summer favorite, folks (as demonstrated by the multitude of clam shacks dotting the Northeastern coast) — and while I was leary about where to find the clams, they actually had them at our local fishmonger, Pop’s Seafood. Let’s talk about the clams. I found it very confusing when looking at fried clam recipes to determine what type of clam everyone was talking about. Websites bandied about vernacular like steamers, soft shell clams, Maine clams and Ipswich clams. Turns out they’re all pretty much the same variety of clam (the biggest difference being from where they come from). Having come from Virginia, I thought a soft shell clam would have a “soft shell”. Not. The shells are just thinner and more brittle than traditional little neck clams and other varieties. There are three main components to the clam. Belly – The belly (the most tender part of the clam) is the soft, round center of the clam. Strip – Clam strips refer to the loose hanging piece under the belly. Neck (Siphon) The neck is actually the chewy and kinda gross part that protrudes outside of the clam. A whole belly clam refers to the entire clam insides (belly, strip and neck) and that’s what we’re making today. 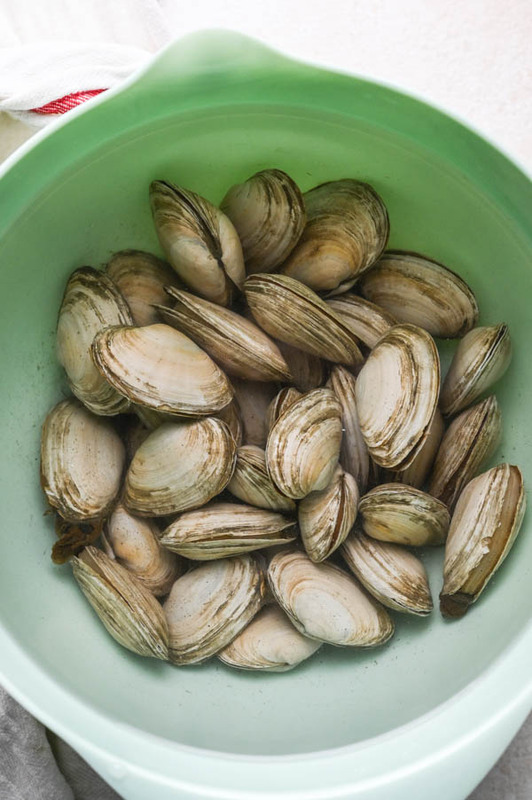 Once you’ve obtained the clams, you want to give them a good soak in fresh water. This allows them to naturally discharge some of the sand and grit that they may have in their siphons (neck) and loosen it from the outer shell. 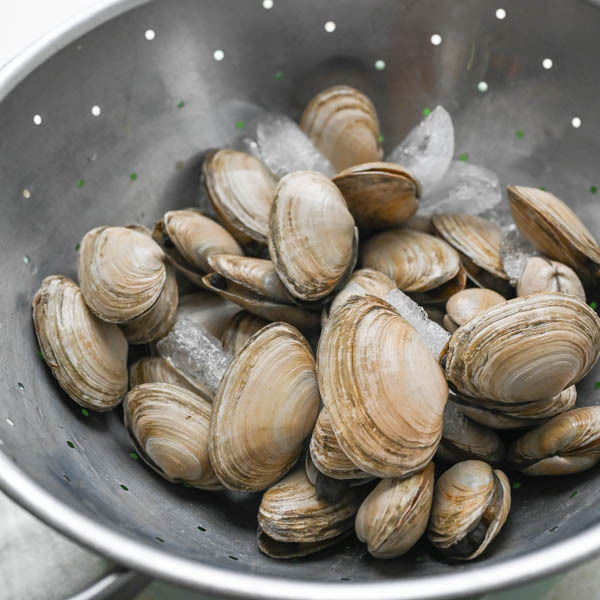 So here’s the skinny on how to shuck clams… These bivalves are not interested in becoming your game-day meal, so prying them apart with your bare hands will prove a battle of wills, that, trust me, the clam will win. So, how do you get to the briny mollusk? I watched a multitude of You Tube videos and these two were comprehensive. Cut through the muscle on either side of the clam next to the hinge. Once the muscle has been cut, there’s nothing holding it shut and it’s easier to open. Run your knife around the clam to free it from the shell. Remove the unsightly outer membrane from the neck (the dark black portion of the clam). Slit the neck vertically and check for any grit or sand. Transfer the clams to a clean bowl of cool water and rinse several times to ensure no grit is evident. Add the clams and let them blanch in the water for about 20 seconds (this won’t kill the clams, but it’ll relax them, like a hot sauna would relax you.) Click here to see how we did it. Drain the hot water and immediately plunge them into cool water. Swish with your fingers to help dislodge sand and grit (there’s a lot of it with these guys — cause they live in the mud). Remove a clam from the water and gently pull apart the shell — click here to watch how super easy it is. Scoop the whole belly clam from the shell with your fingers. Pull on the outer layer of the neck (the nasty bits) and discard the membrane. Cut the black tip on the neck, it’s the chewiest part of the clam. Not all people do this, but I recommend it. Transfer the whole belly clams to a bowl of fresh clean water and give them a swirl to dislodge the grit. Now they’re ready to use. 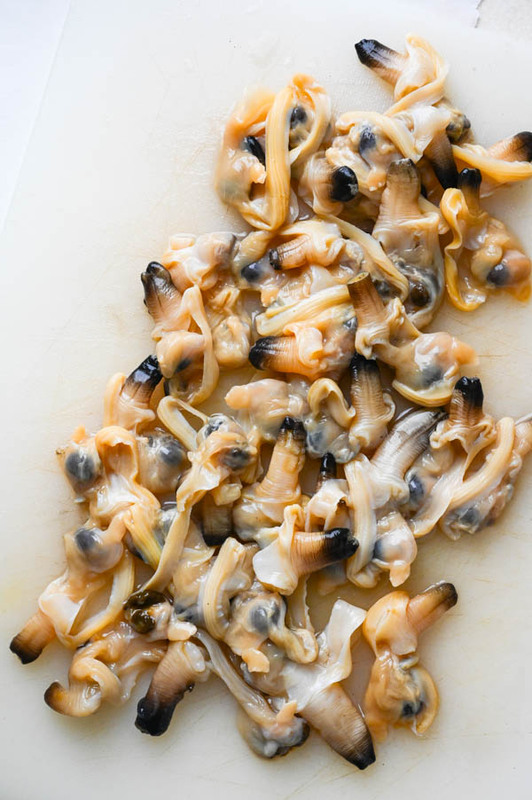 To fry whole belly clams, you’ll want a simple dredge. The classic formula is a mixture of flour and corn flour with salt and cayenne pepper (optional). I had never heard of corn “flour” before and mistakenly thought that it referred to Masa Harina. It doesn’t. 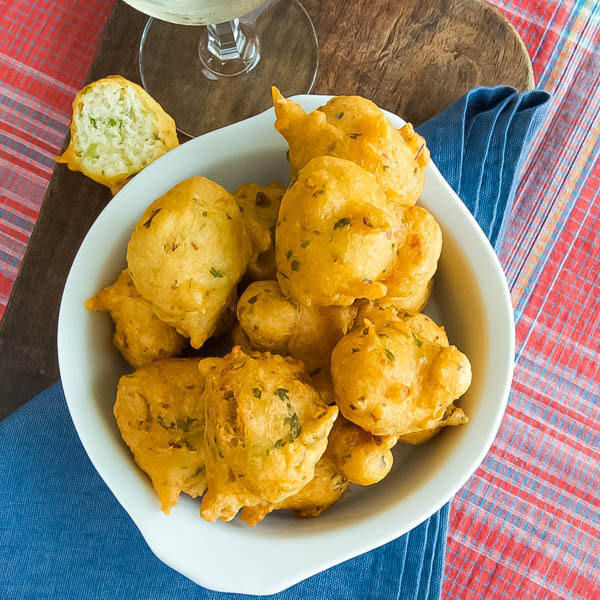 Corn flour is commonly known as “fish fry” and you can find it in the grocery store near the flour and cornmeal section…. however, if you have fine ground cornmeal in your pantry (and I always do), you can also use that. The cornmeal will add crunch to these savory, chewy Ipswich clams. The dunking batter is simply milk, buttermilk and eggs all whisked together. 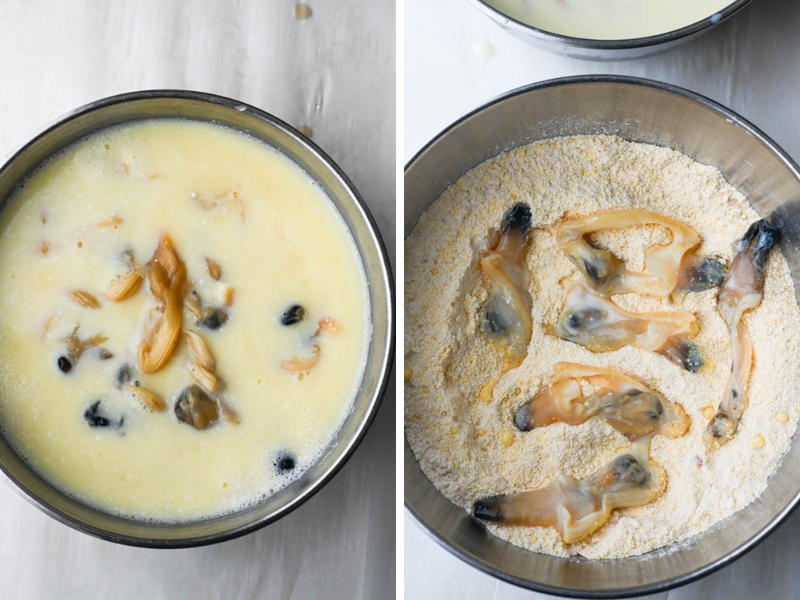 Dunk your clams in the buttermilk mixture and one by one transfer them to the cornmeal blend to dredge. Then carefully tuck them into the hot oil. These whole belly clams cook in about 1-2 minutes. They will be golden and gorgeous on the outside with a pleasant briny bite. 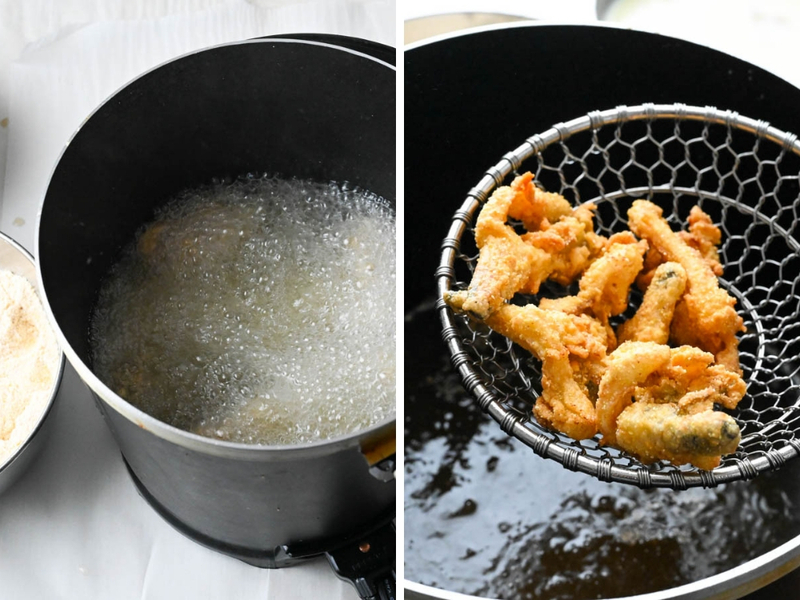 Transfer the fried clams to a sheet pan lined with craft paper (or heavy duty paper bags) to drain. Season lightly with salt after they’ve come out of the fryer. Serve the clams with tartar sauce and a wedge of lemon. I hear they sell bottled tartar sauce in the grocery store, but honestly, I’d rather mix it up myself. This simple tartar sauce blend takes about 5 minutes to make — though you should make it before you start on the clams. You don’t want your hot clams getting cold while your mixing the sauce and besides, making the tartar sauce in advance allows the flavors to marry. The traditional New England clam shacks complete the meal with a bed of french fries. 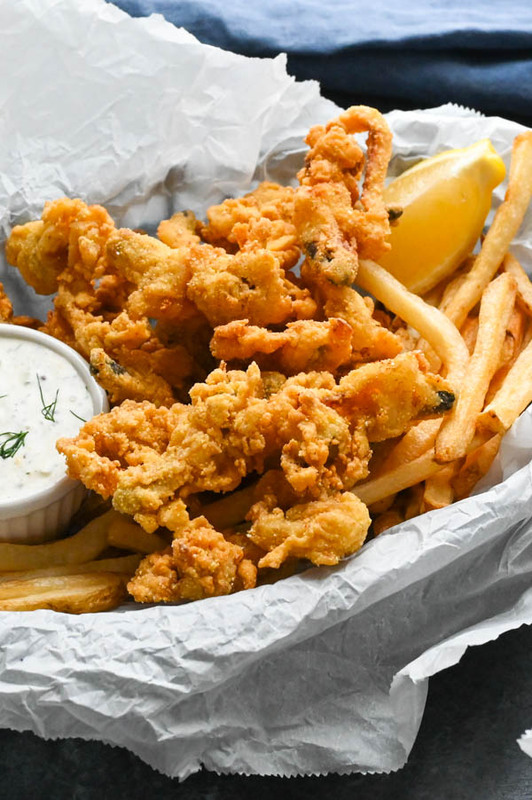 I can attest that they go together well — though, I admit to accidentally dunking a clam into ketchup and fries into the tartar sauce on a few occasions. You can’t blame me, it’s all so good! 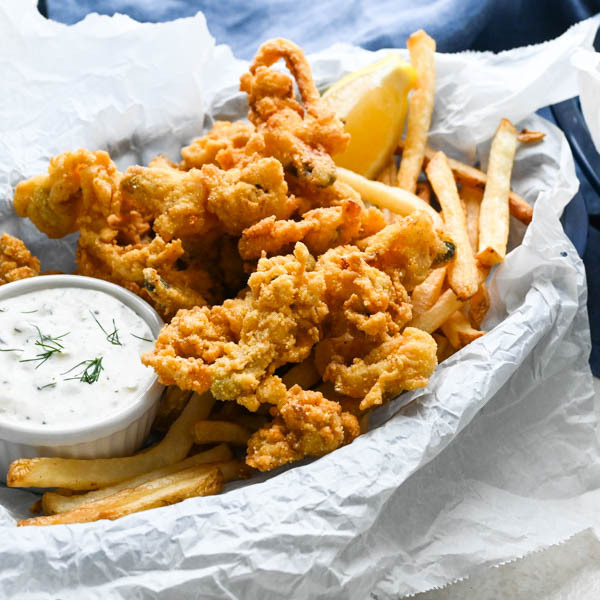 Crispy golden fried clams are crunchy, chewy and a little bit briny -- all in one bite. Great with homemade tartar sauce and fries. In a small bowl combine all the ingredients and whisk together. Cover and refrigerate. Place the clams in a large bowl and rinse them several times with cold water to wash away the grit and sand on their shells. Cover the clams with fresh cold water and let them sit for 20 minutes so that they can expunge any excess grit in their siphons. Bring a pot of water to a boil. Drain the clams and add them to the pot. Blanch the clams for 20 seconds, then immediately drain the water off of them. Transfer the clams to a fresh bowl filled with cold water to stop the cooking. Pry the shell open with your fingers (this would be impossible to do if you didn't blanch them first.) Remove the clam and locate the black protruding neck (actually a siphon that they use to filter their food). Go to the base of the "neck" and pull the outer layer or membrane from the clam and discard. Cut the tip of the black siphon off and discard. Transfer the shucked clam (this includes the neck, belly and strip) to a bowl of fresh water. Continue to shuck the clams in this fashion. Change the water several times to make sure the grit has been removed from the clams and set aside. 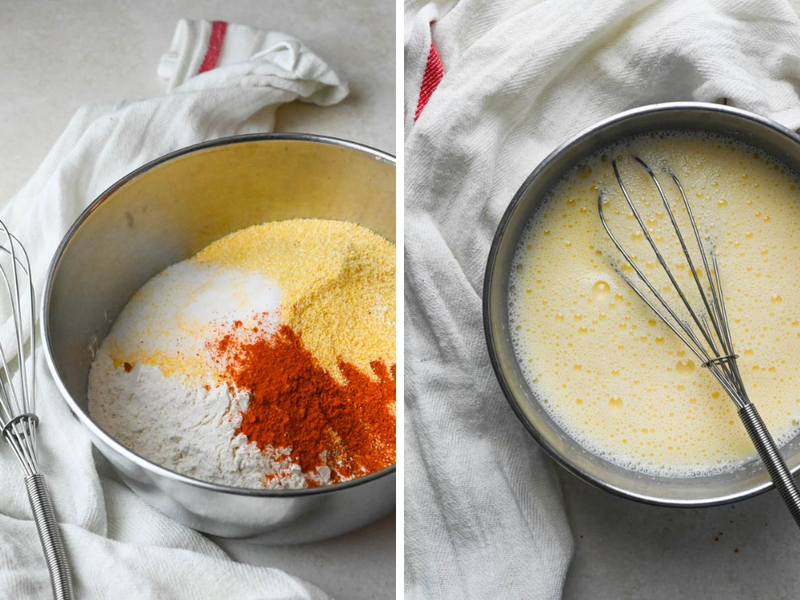 In a medium bowl, combine the flour, corn flour (or fine cornmeal), salt and cayenne pepper and whisk to combine. Set aside. Use another medium bowl to combine the milk, buttermilk and egg with a whisk until well blended. Heat 2-3 inches of peanut oil in a deep fryer to 375°. Line a baking sheet with craft paper, newspaper or brown paper bags to soak up the oil. Dip the clams into the egg mixture and then toss them individually in the corn flour blend to coat. Fry the clams in batches with no more than 8-10 clams per batch. Cook each batch for 1-2 minutes or until the clams are crispy and golden. Using a spider, transfer the clams to the paper lined baking sheet to cool. Sprinkle with a pinch or two of salt. Continue frying and seasoning the clams in this manner. Serve the clams with simple tartar sauce and a wedge of lemon. Most New England clam shacks also serve them with french fries... I used a frozen bag of Alexia fries and crisped them in a convection oven... worked great! Pin “Fried Whole Belly Clams” For Later! 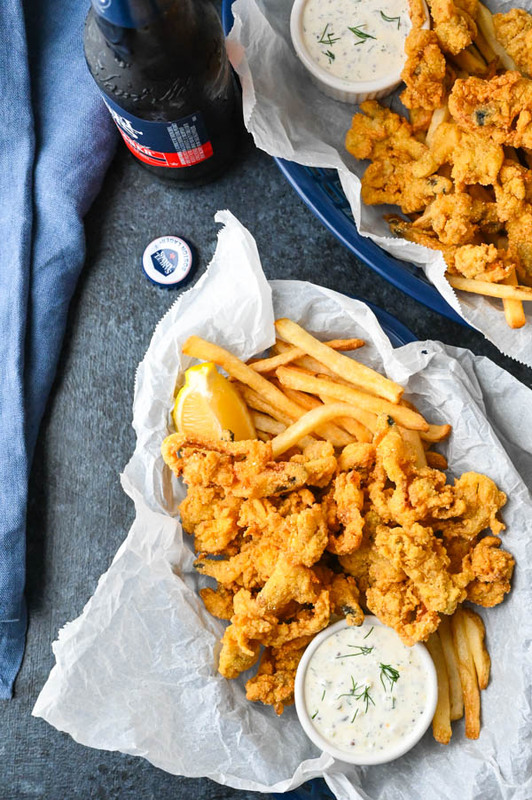 I love fried seafood, but I have never had fried clams – its just not a thing where I live. Thank you for the excellent tutorial! I love clams in pasta, and I would love to try making fried clams at home. To be fair, it’s not a “thing” here either, but I figured I had to go the extra mile for the Patriots. How fun that your whole family participates in planning the Super Bowl menu. Love that. I’d say you have one lucky family if this is what they’ll be munching on this Sunday. (Go Rams!) And your tarter sauce recipe sounds superb! I want a big basket of these clams ASAP! The homemade tartar sauce sure takes then to another level too. Thanks, Sharon! I’m so glad you like them! Oh boy, these clams have me wishing it was warm and sunny out because I would love a great big plate of these out on my back porch. Yum! I know, they’d be perfect in the summertime, too. That said, they weren’t bad in the dead of January! Yum! 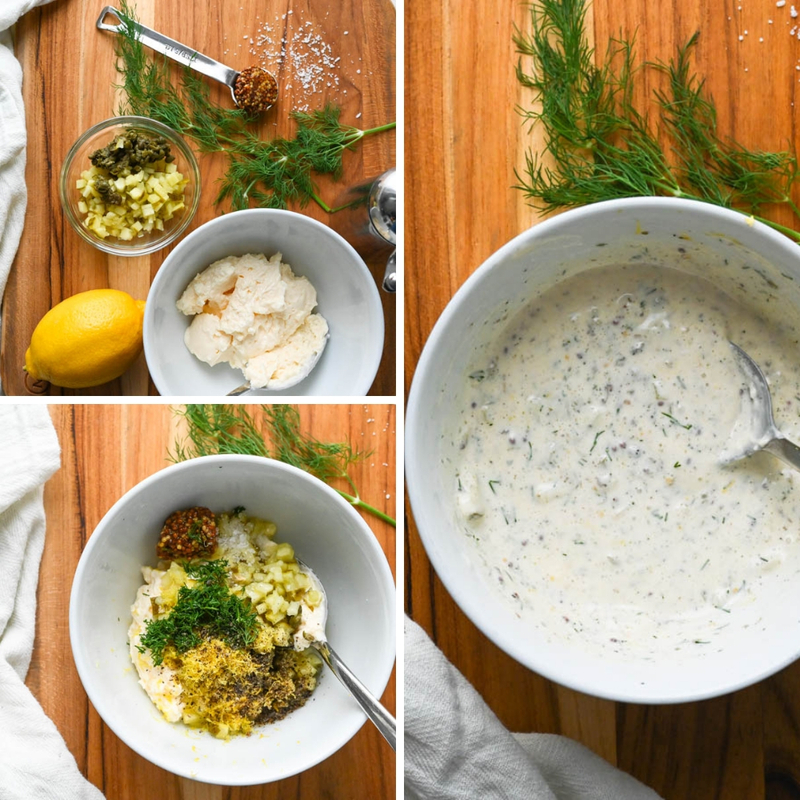 This reminds me of when I lived back East – Tartar sauce is the tastiest!